· After years of learning things the hard way, we have come to understand the seven deadly performance sins. Now we are about to give you the upper hand in avoiding these seven sins. · At the racetrack, minor adjustments could mean all the difference between setting a course record, winning a race or falling short. It can also mean the difference between staying on the track versus off-roading or worse, slamming into a k-rail. 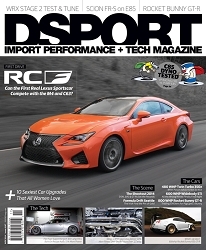 · Scion invited DSPORT to Sodegaura Forest Raceway in Japan. · This avid documentary watcher and self-proclaimed nerd also shoots hoops like a pro and takes muy thai martial arts for fun. 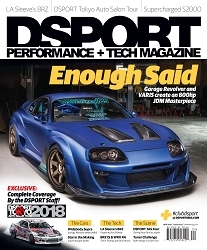 · The goal would be to build a lightly tuned version of the 2013 Scion FR-S for the US media unveiling taking place just a week later. · After building the 350Z at his shop for Tuner Icon, he ended up buying the car for his own. · Josh Carpenter had just completed his service with the Navy when it was time for him to shop for transportation to get around his new home in Colorado. After watching online videos of high-powered EVO VIIIs tearing up the streets, drag strips, and road courses, his decision to go with the four-wheeled transportation was made. · After taking delivery of a WRX in 2001, Aaron Wells invested into it with a goal of making it just like an STi. This brought him temporary satisfaction until the STi was released in America two years later. · The silence surrounding the track at Streets of Willow was interrupted with the engine-screaming, exhaust-buzzing sounds of racecars. Watch out, here come the B-specs. Los Angeles Auto Show 2011: Automobile Manufacturers Yank the Covers in the City Of Angels. · An annual event that usually showcases world and North American debuts of manufacturer concept and production vehicles. · Held on Veteran s Day weekend, the Southeast Face/Off was a two-day event that started on Saturday, November 12, 2011 showcasing battles on Fayetteville Motorsports Park s 1320.